These things are more than made up for by the beautiful things that happen. Like when you were born and came to us. I SEND some pics to K. and Jessica in England. 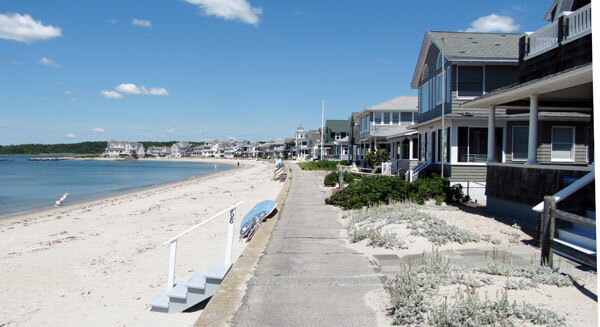 We are in a very nice spot on the coast of Connecticut, Groton: all-White, very quiet, crime-free, no doors are locked at night. THE first booking for our autumn USA tour comes in, for Sherman Oaks, California, only hours after the announcement. During the day several more follow, including some for the dinner tickets. The new announcement really does the trick! New lecture title: HITLER AND I. David Irving, British historian and raconteur, talks about Hitler and the men and women closest to him. 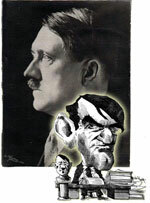 The tour's logo is based on a hostile caricature which The Guardian used when it reviewed Hitler's War in 1977. Mr Irving bought it from the artist. WE DRIVE to Princeton university's Seeley Mudd Library, where I work until four p.m. on the papers of Allen W Dulles, first director of the Central Intelligence Agency. He was chief of the OSS in Switzerland in the war, and played a fateful role in the July 20 bomb plot against Hitler. His code word for the plotters was BREAKERS; I call them "traitors". I have prepared the visit thoroughly, and send for twenty-one boxes, and I am finished by three p.m. 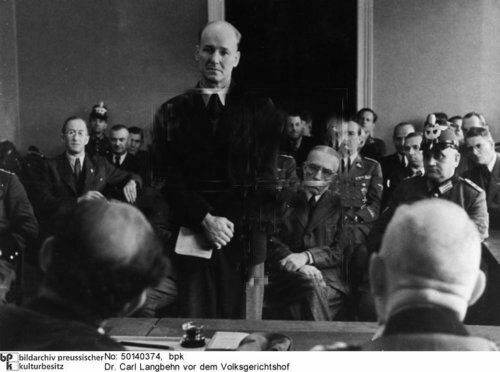 Unexpectedly, I find excellent docu-mentation on the Carl Langbehn case, which Dulles called his "Flirt with Himmler," including the entire People's Court file on Langbehn's 1944 trial (photo) and execution. According to Dulles, the file "fell off the back of a train" in an air raid. Hmmm. Be that as it may. I copy every page of his draft typescript of Germany's Underground relating to the decoding of his OSS messages by the Germans. In all I photograph 135 pages of documents. His wartime OSS files are largely absent; we can use only the digitized files released by the CIA. Judging by the summaries of his code telegrams in his memoirs, which are presumably already redacted, he put far more in his messages to Washington about the Stauffenberg plotters than was safe for them, and quite needlessly. All were hanged, and not a few have Dulles to thank for that. I OPEN the package containing the replacement Mac which Martyna has bought for me. It is good, but loaded only with OS 10.5.8. I shall have to downgrade that to the old OS 10.4.11, as I also need to use OS.9. She has done well, but begins a lengthy argument, and I decide to do the Philadelphia meeting alone this evening -- entailing a three-hour drive alone in each direction, plus an hour unloading and loading, and two hours speaking. She stays in our borrowed apartment sulking all day. I LEAVE Falls Church at two p.m. While I am still on the road I get a phone call from Micro Center; they have completed the transplant between my two Macs, but the replacement will not now "power up". "It may not be ready now until tomorrow." That may be very bad news. Fortunately, I have already sent out the locations for tomorrow evening's Baltimore meeting, but not yet for Friday's in New York City. I arrive at the Philadelphia location at five-thirty p.m. I have meanwhile received several phone calls from our guests this evening, stating that they have mysteriously received the original (and superseded) Holiday Inn location again, emailed to them at two-thirty p.m. today -- when I was already on the road. How has that happened? At ten-thirty p.m. I drive back to the apartment in Virginia. It is a smooth ride at seventy mph the whole way back. I slump briefly into a comfortable sofa after I arrive exhausted at one-thirty a.m, only to fall asleep there; it is 2:20 a.m. when I am awakened. AT ten-thirty a.m. I am back at the Micro Center, but they inform me that the technician working on my machine is not even in today, he has taken the day off. That is just dandy. Now I have no means of contacting tomorrow's New York guests, as their names are all on that machine. I am stunned by this unexpected problem. I cannot blame anybody but myself for this malheur either. I shall have to cancel the meeting altogether. That will cost us several thousand dollars, plus endless paperwork. With such a multi-city circuit it was perhaps inevitable that I would lose one meeting, but not the biggest of the tour. It is a disaster. AT one p.m. we drive into downtown DC and up to Capitol Hill, where I have a business to transact. . . [Name] is getting forgetful and fluttery, but he has a heart of Gold. His office is crowded with staff and supporters, and [name] struts loudly in at one stage. He hands over to me the thirty-five original 35mm microfilms illicitly acquired by a third party, a Russian, from the KGB archives in Moscow shortly after the Soviet collapse; they contain captured files of Heydrich and Himmler materials and the RSHA -- the Reich Security Agency --, and this time he copies for me vital letters identifying their provenance in the manner that every responsible archivist and historian requires. It seems that he paid between 315,000 and 500,000 US dollars for these microfilms, provided by a donor whom he names to me, in about 1997. He has not used them. I am the first. He starts talking about their monetary value now but I cut him short as tactfully as I can: until I have reviewed them all I cannot form an opinion. On the basis of what I have seen on eight of them this spring it seems they are all from Opis 500 in the SBA, the special archives in Moscow, the Osobyi Archive. Very valuable for my work on Himmler, I agree. Back at the house at 1:25 p.m. . . I phone N. and ask him to accompany me up to Baltimore this afternoon. On the drive north up I-95 in heavy traffic. . ., the trip takes us one hour and forty minutes. At 4:45 p.m., I phone Micro Center. They bleat that "unfortunately" the two machines will not be ready today, as the technician doing the transplant has not come in today etc., etc. I knew all that already. New York City is therefore finally cancelled. We unload into the fair-sized meeting room in the Double Tree hotel near Baltimore airport. . . It was the only one I knew of in the Baltimore area, and is packed with Blacks and both glitzy and sleazy inside. Meanwhile I have to field a dozen phone-calls from my worried New York City guests for tomorrow. I have to tell them that it is off, and that I will email the explanation to them tomorrow -- if and when I get my equipment back from Micro Center. I remain philosophical about it. The evening in Baltimore passes well with only two empty chairs. I GO with her to Micro Center, ready to let rip. They have however got both machines working again. I limit myself to telling them their technician's unannounced day off has cost me several thousand dollars. I am philosophical. Spilt milk. As for the New York City meeting, it is lost beyond remedy -- there is no way I can contact all the guests, arrange a new location, and get up to New York City -- a six or seven hour drive -- in time for this evening's cancelled meeting. 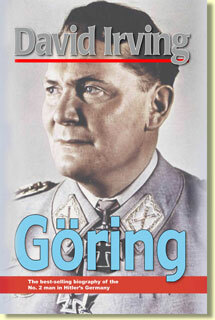 INSTEAD I go downtown, and work for two hours in the Library of Congress, viewing once again, after over forty years, the Hermann Göring photo albums, looking for photos of the famous party he threw for the Gestapo officers and their wives after the Night of the Long Knives in 1934. The albums are now viewable only on microfilm, the frumpy desk lady announces with a triumphant glint in her eyes, saying that they have not allowed researchers to use the original albums for twenty years or more -- in fact, she adds snootily, "for as long as I have been here". I say I was there in 1965 and used them then. That shuts her up. IN the evening Martyna takes me to an AMC movie theatre at Tysons Corner to see a sci-fi movie, The Avengers, her choice. The movie is huge fun, with amazing digital effects and a cute actress Scarlett Johannson blessed with roughly the same curves and wit as her. The audience laughs at many gags which go over my head, but misses one line I did get: When Scarlett, the "Russian" heroine, says, at the height of the highly enjoyable Battle for New York against Space Aliens, "This is just like Budapest!" the arrow-quiver-toting male hero, seemingly from Eastern Europe, says, "You and I see things differently." Martyna explains that this is about the seventh in a series of Avengers movies. I ANSWER an earlier message from my youngest daughter: "I am not happy to hear about you going to yet another 'Music Festival' today. You have got to start a serious life, Jessica, and that does not include such events. I am keeping my fingers crossed about exam outcomes. . . I am on the road for the next six hours driving over to Cleveland." We set out from Falls Church for Ohio at eleven-thirty a.m. Almost at once there is an "Unidentified ID" caller on our phone. I am inclined to ignore it, for security reasons, but Martyna picks up. It is Jessica, reporting that two Black men have mugged her in Hackney [a grim London suburb] and stolen everything she had. Her bag contained her credit card (and mine), her Oyster travel card, her phone, and some cash. She has been crying all day. She chased after the men for half a mile shouting, but they got into a car and drove off. The London police have been very nice all day with her, she says. I pull into a parking space to talk at length. I tell her to sit down and calmly make a list of everything that was stolen, and then check off what has to be done. First and foremost, contact the banks to cancel both cards. I am pretty angry and ask what on earth she was doing in a neighbourhood like Hackney. She was there for the music festival she says, and I am pretty explicit in my response. I hope that teaches her something. She does need educating about what seems to be the disproportionately inherent propensity of Blacks for criminal behaviour. This episode will put an end to her goody-goody Lisa-Simpson brand of liberalism, if only for a while. As they say, "A Conservative is a Liberal who has been mugged." What on earth were our politicians thinking when they began systematically flooding Britain with Blacks since the 1950s? At least she was not physically attacked. WE cruise the turnpike all day, through the rolling hills of Maryland and Pennsylvania to Ohio. Another message comes from Jessica, and she is quite distraught: "I'm really sorry but they won't let me cancel your card, as it isn't my card. . ."
Don't worry Jessica. I will do it from here tomorrow. Fortunately there is no money on the card so they can't steal it! 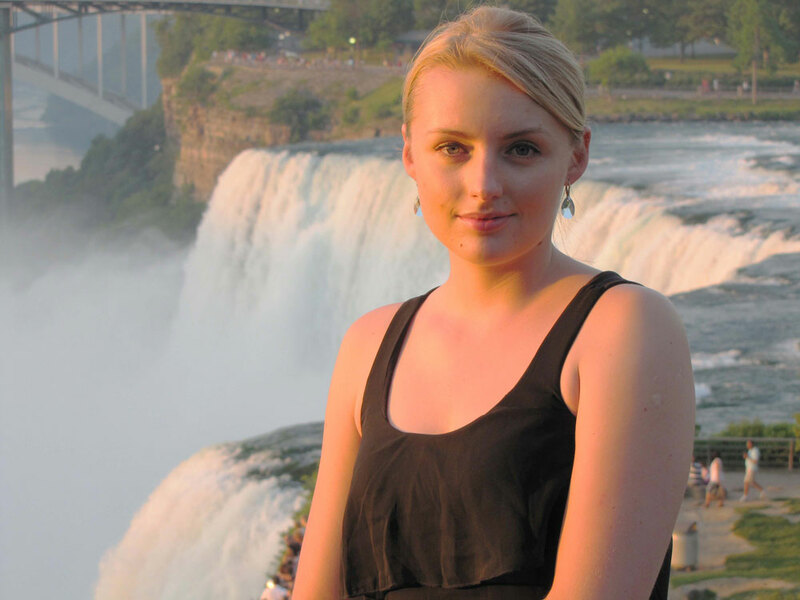 I am so glad those thugs did not attack you personally -- one of Martyna's friends had her face horribly smashed up in a mugging in Key West by two Black thugs two months ago, I saw the photo. Been driving five hours today, and still another hour or so to go to Cleveland where I speak tomorrow evening. MY back is complaining from all the heavy lifting of the last few days. You are a completely disgusting human being for writing the books that you did and for your pathetic and worthless views. Actually, it is you sir that is a worthless human being. I am a person who believes in and understands human rights and equality, something that you obviously were never taught in your sad life. I don't know how you sleep knowing the words that have come out of your mouth and written on a page. How could you possibly deny the Holocaust, with all the physical evidence that exists, you really must be a complete idiot, I don't know how your garbage even got published, but I guess there are many idiots in this world just like you, it is because of people like you that there is suffering in this world to begin with. I read that you supported Mel Gibson's comment that "Jews are responsible for all the wars in this world"? How could you possibly state something like that. If you had half a brain you would understand that it is disgusting, evil, selfish and greedy people with twisted views and values that are responsible, people that are just like you. I don't even understand how you got out of prison in only three years, you deserve to be kept there to rot for the rest of your pathetic life. I hope that you read this and that you get harassed every single second of your miserable life because it is the least that you deserve. Denying the Holocaust, after millions and millions of people were tortured and killed and suffered, makes you just as garbage as the people who killed them in the first place. You are a shame to our history, to our society and to our planet and the only people who read and believe your garbage are scum just like you. You are the a prime example of scum that lives on this earth, you pollute our planet, you are a cancer. All rather over-the-top. It reminds me of a New Yorker cartoon, in which the judge screams at the accused, "You are a disgrace to your school, your family, your regiment, and everybody born under the sign of Capricorn." Dear Ana, I assume I have your permission to publish your hate-mail on my website with your full name and address? Or would that be considered "anti-semitic"? I shall of course correct your spelling and grammar where necessary. She replies: "You do not have access to my full name and address." I reply: "That is what you think. . . Lesson for next time: Think before you dip your pen. Too late this time." SHE has thought it over. I don't want anyone to know my address because that is my family home, I don't need anti Semitic harassment to my parents and little brother. Don't throw your stupid quotes at me their [sic] completely meaningless. Incorrigibly, I reply: "Thankyou. Now we have your phone number too." SOME woolly-minded juveniles might say that makes me something of a "stalker", I suppose. But it is in self-defence. Stand Your Ground. Jessica wails: "Trying to replace a provisional driving licence; it's a nightmare!" I tease her, as fathers do: "Shouldn't ha gon to Hackney, Bro'"
She sees the funny side of it. "Hahaha." But adds: "I hate my life." "On the contrary, it is called growing up!" As for "hating her life," I encourage her: "Nonsense -- these are tiny flaws compared with what one will face later on. And they are more than made up for by the beautiful things that happen. Like when you were born and came to us." We drive all day and arrive at Columbia in South Carolina at six p.m. Martyna drives the first half, I the second. Russian TV, the Zvezda (Star) Channel, which reaches an audience of sixty million people, wants to film an interview on The Destruction of Convoy PQ17. That's nice. Publishing it in the old Soviet Union, Moscow paid for the rights quite properly but in roubles; present-day Russian publishers just pirate my books -- all of them -- without paying. As I leave the hotel for this evening's Columbia meeting, the last of this series, I get a worrying email from another of tonight's guests: he too has received just a blank email from me and does not know where to go. I hurry back upstairs and send out fresh emails to all the guests, and I print a list so I can phone them too. Several are from out of state, Georgia, and cannot possibly make it if they are not already on the road. Fortunately most of them have indeed received the location, it turns out, and soon there is only one empty chair. It is my last talk on Heinrich Himmler, and perhaps the best; the first segment is filmed by a production company for Britain's Channel 4. WE invite one guest to a very pleasant supper afterwards in the town's tourist zone. He says Jaenelle about a month or so ago told him that her wealthy Australian fiancé Gerwich H. Bode has applied for a job (he did not say where) and is waiting for the results. . . He regales our waitress with endless but saucy jokes of a funniness disproportionate to their length. As we finish supper, Jaenelle, God bless her, posts a lengthy and acidulous screech on Facebook, timed "49 minutes ago," i.e., at about eleven p.m. She seems very shirty about something. Her new post berates a "balding" Alabama lawyer for having researched legal databases and discovered her current US address on a February 6, 2012 home-purchase contract. It relates to the condominium she has bought with her current wealthy Australian beau in Indiana; she screeches that the lawyer forwarded the data unsolicited to me, whom she now rather illogically terms a "geriatric stalker." The half-dozen comments which her post attracts indicate that her coven of Facebook fans urges her to proceed against the Alabama lawyer for having acted "unethically". Quite apart from her disastrous experiences with the Indianapolis shyster-lawyer Andrew Dutkanych, I doubt that that would stick. Using quite ordinary expertise as a debt-collecting attorney, the Alabama lawyer merely researched public files; he did so without my asking him, but he had gathered from my the Radical's Diary that I am still stalking my ten or twenty missing boxes of autographed books, which have not turned up where she said she put them (namely in our company's Indianapolis storage unit). I last saw the boxes when I put them in her rented vehicle in Washington DC in November. I stressed in the Radical's Diary piece that -- apart from the valuable boxes -- I have moved on; or stalked off, as others might say. WE set out for Atlanta at ten-thirty a.m., nearly three hundred more miles away, in 108-degree heat. This is a big country. We get to our other storage unit there around five p.m., and Mrs. D, my new bookstore manager, joins us five minutes later. I unload a ton of boxes in the sweltering heat. To lighten my airline baggage I also unload everything personal which I shall not need until the autumn tour series begins. High point of the tour: With Martyna driving, we reached the Niagara Falls, and I spoke to an appreciative audience of Americans and Canadians who came over the bridge (background). AN early start, now that it is all over. Up at six. We return the Expedition to Hertz at the airport; it is 11,021 miles older than when we collected it here almost brand new two months ago. Our ticket locator is not accepted by the terminal's computer system -- although I key it in correctly twice -- and the screen instructs us to go to the ticket desk for processing. I wonder why? I carefully padlock four of the tags securing my one suitcase before checking it in. We catch the plane with ten minutes to spare after a lengthy security-line delay. I have paid a modest amount for upgrades to Business Class for us both. As usual this turns out to buy me less leg-room than the regular seats. On the second leg, from Orlando to Key West, we are separated and Martyna gleefully sits next to a platinum-blonde frump of the same age as her; I hear her indoctrinating The Frump about The Boathouse, evidently a fashionable watering hole in Key West, and their Happy Hour martini prices. ALBERT has come to pick us up. He is looking gross, deliberately he says, in a back -to-front cap, sweat-stained shirt, baggy shorts and untrimmed, greying beard. It does not become him. I notice that the padlock on my case is now looped through only two of the four tags -- so somebody has been into the case. Sure enough, the contents have been rearranged, and there is a printed leaflet inside about random checks. It has been snooped into by TSA at Atlanta, and I wonder who else. "Random," my foot. Lunch with Albert at Harpoon Harry's. I phone London and chat with Bente for half an hour. . . She asks how well the Polish girl has fared, and did she stay the two-month course? I say that she was . . . an excellent and safe driver. I paid her two days ago and this, as Bente tartly remarks, has probably placated her, if only momentarily. Under the pressure of "activists," says Albert, Key West city council has introduced a blanket speed-limit of twenty mph. A flashing sign announces this horse-and-buggy innovation on the bridge. The old 35 mph signs are still up. Presumably motorists can take their choice, but at their own peril. David Irving: The Destruction of Convoy PQ.17 (free download).